Gardening has become a new hobby of mine for more than a year now since I live in my home country Philippines during wintertime in Europe. Leaving Germany for a tropical weather is an opportunity to escape from the cold that aches my bones. Surely, I appreciate the good life that God has given me and of course not to forget the kindness and the understanding of my better half. That was in the last quarter of the year 2011 when I arrived in my hometown and spent a few months until spring 2012. It was a coming home from a long journey. It was good, but there was something lacking. My mother was no longer there. She´s gone to heaven. I could see that by her absence, our front garden was a bit "deserted". 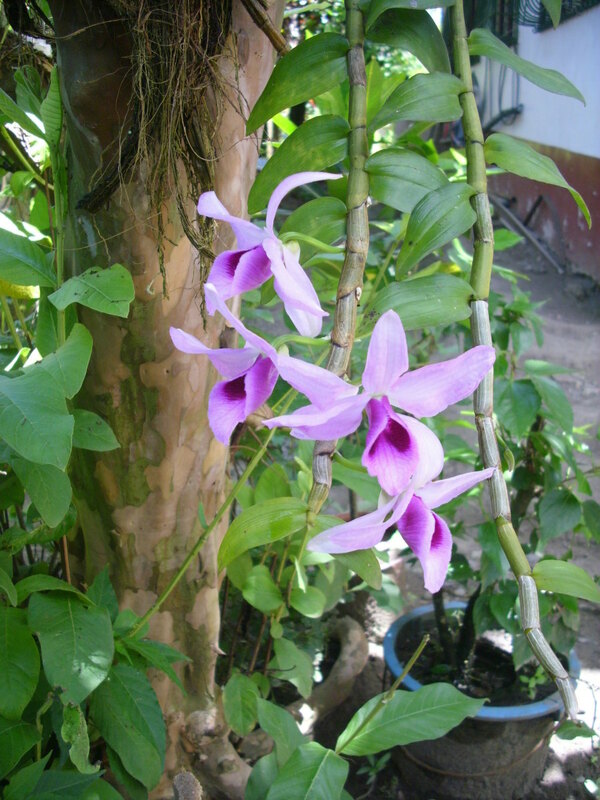 I was upset at the appearance of the garden that I wrote a poem, My Beautiful Orchids. It was not only the orchids which were dying. Other flowers like bougainvilleas, too. On that first week of my arrival, I started gardening. I planted new plants and I communicated with the old ones. I know it sounds weird, but I do really talk to my plants. I don´t care what other people think about me. Now, the flowers are rewarding me with their beauty that I have to share them with you. 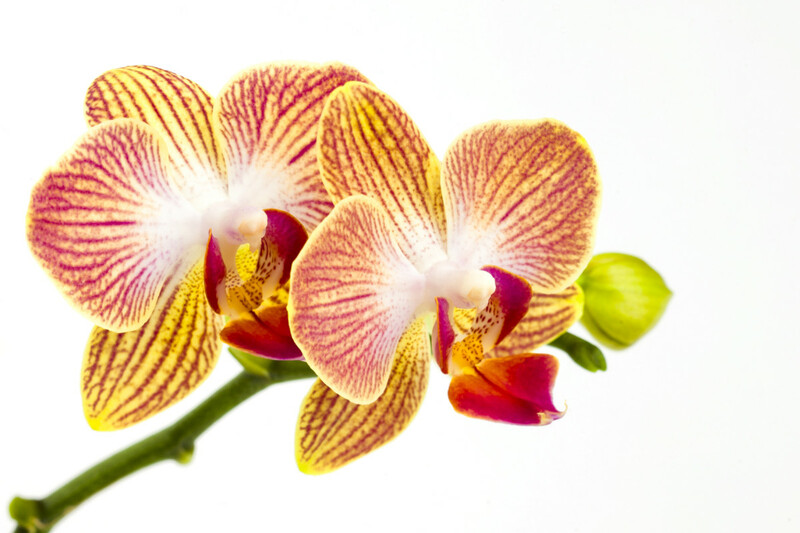 Orchids are one of the beautiful flowering plants that I love. They have varieties of colours and fragrances. They are commonly found in the tropical climate countries like Philippines, Thailand, some Central and South American countries. Orchids are cultivated in temperated glass houses in some parts of Europe like in The Netherlands. They are in pots as they are easy to be sold to the customers. 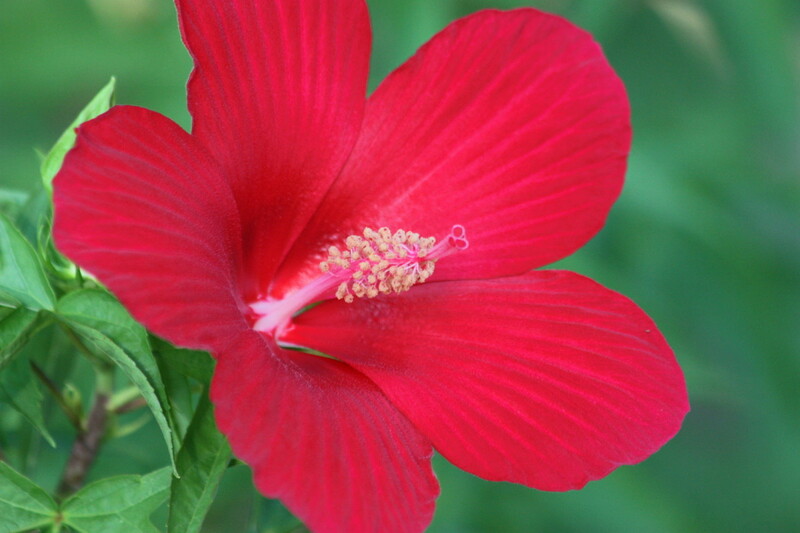 This beautiful flower has many names. 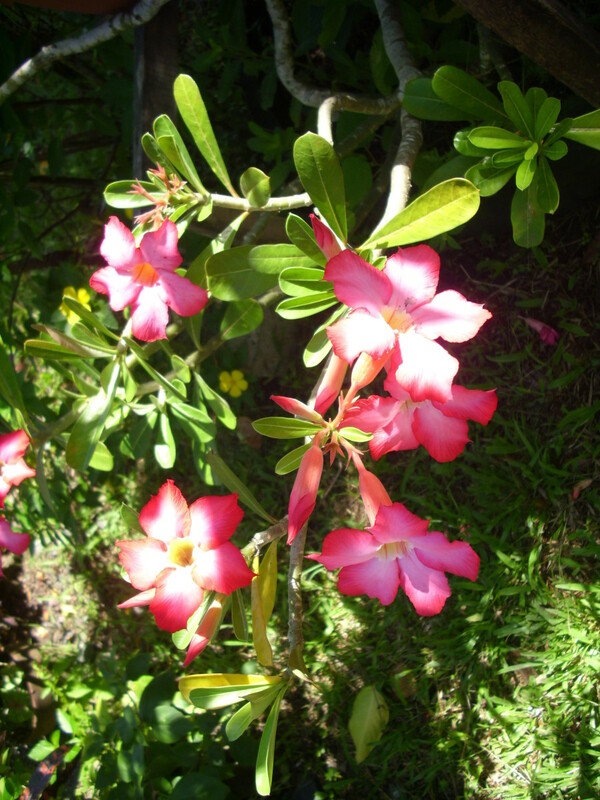 It´s scientific name is Adenium Obesum and it´s latin name is Plumeria. 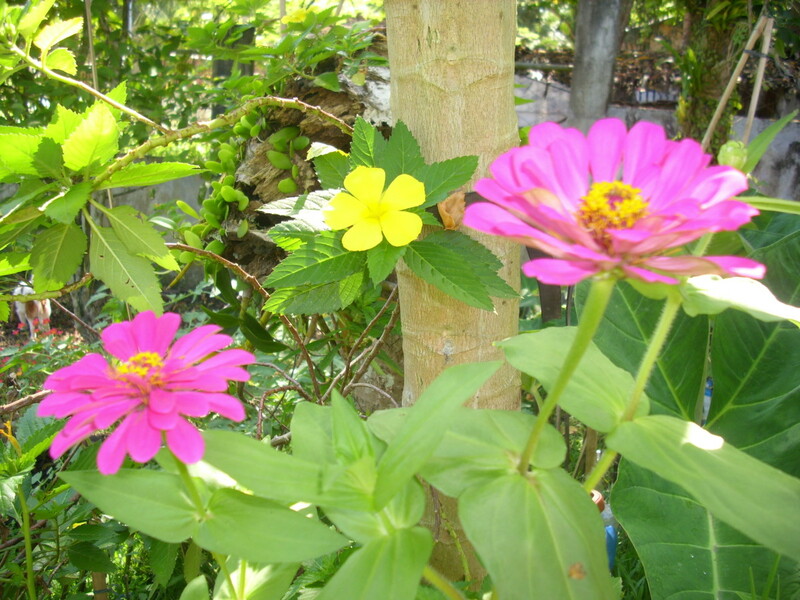 It is usually called Kalachuchi (Philippines), Temple Flower, Frangipani or Desert Rose in other countries.The size of this plant depends on where you plant it. You can have it indoor or outdoor. In a pot or in your garden where it can grow big like a tree. There are pink, white, yellow and in other hybrid colours. My Kalachuchi blooms often in the garden to my delight. It has an awesome fragrant specially at nighttime. This reminds me of my high school graduation day as I got a necklace from my mother made of Kalachuchi. Bougainvilleas are named after an Explorer and French Navy Admiral Louis Antoine de Bougainville. 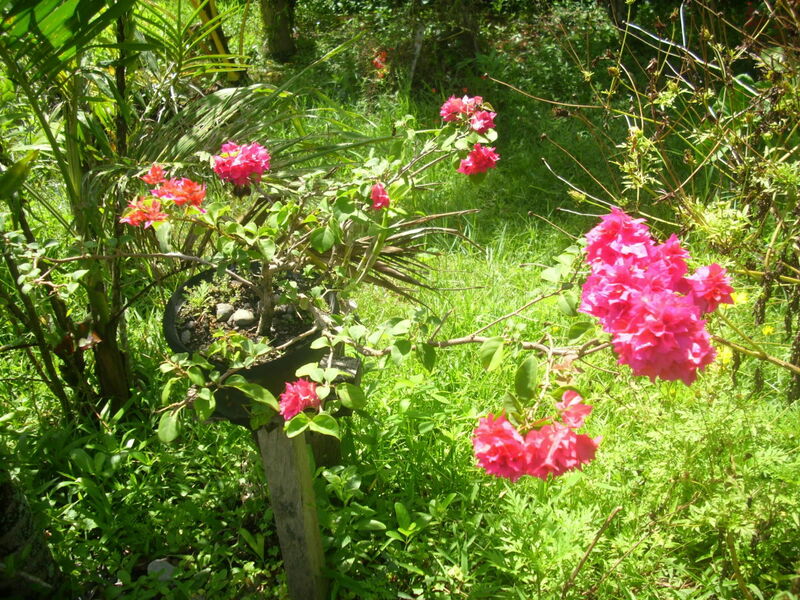 Bougainvilleas are common plants in tropical countries. They are in red, pink, violet, orange and white colour. 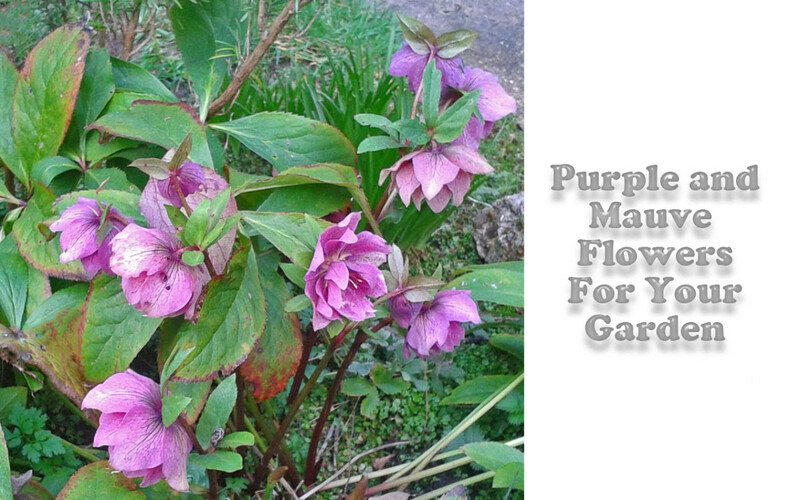 They are easy to grow in the pots, in the garden and usually used as a climber to cover an old ugly fence. 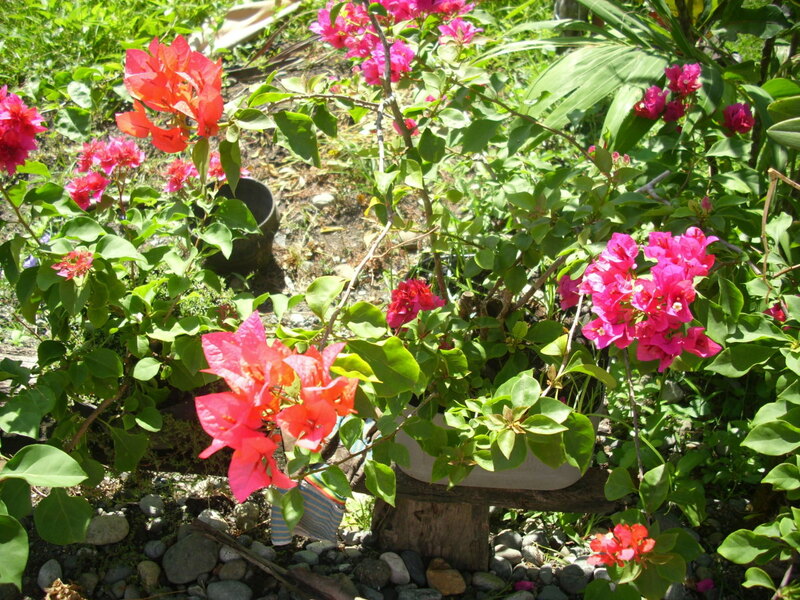 Bougainvilleas are thorny, showy, beautiful and easy to care flowers and give more blooms when they are in stress. You don´t have to water them everyday and they are pest free. You can even trim them to climb on the walls of your houses as a crown. Whichever you want them to be. 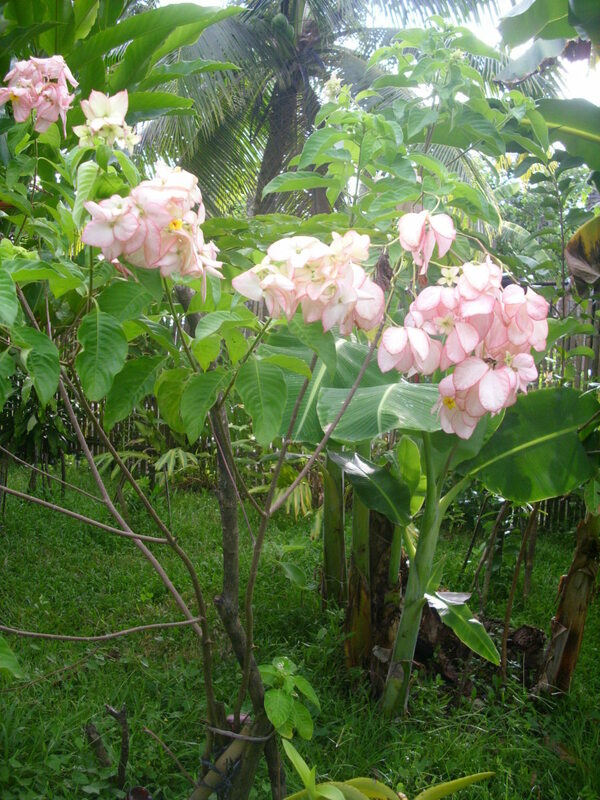 Mussaenda or Dona Aurora (common name in the Philippines) is a beautiful bush flower that is easy to grow. 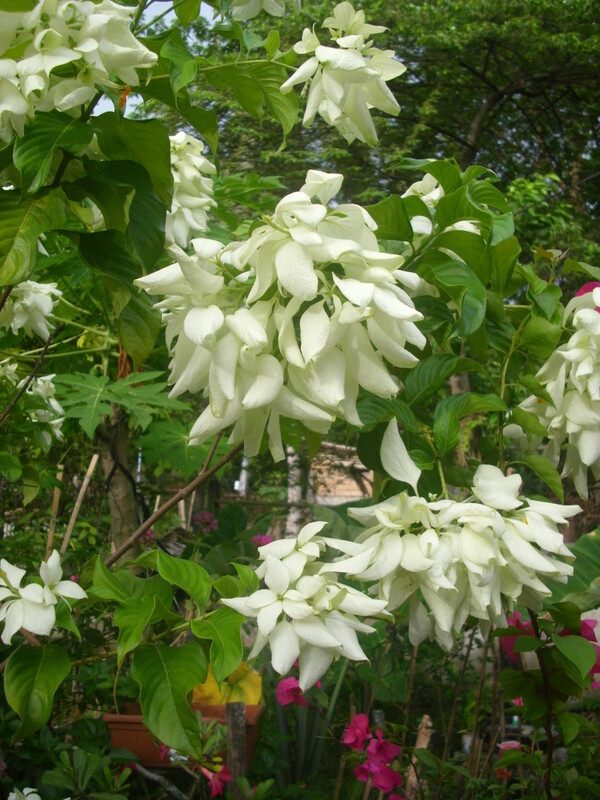 It grows from a shrub until it becomes a medium size tree and it is easy to grow. It blooms all year round. The flowers are in bracts, either in white or in pink colour with a yellow small flower at the center of each bracts. 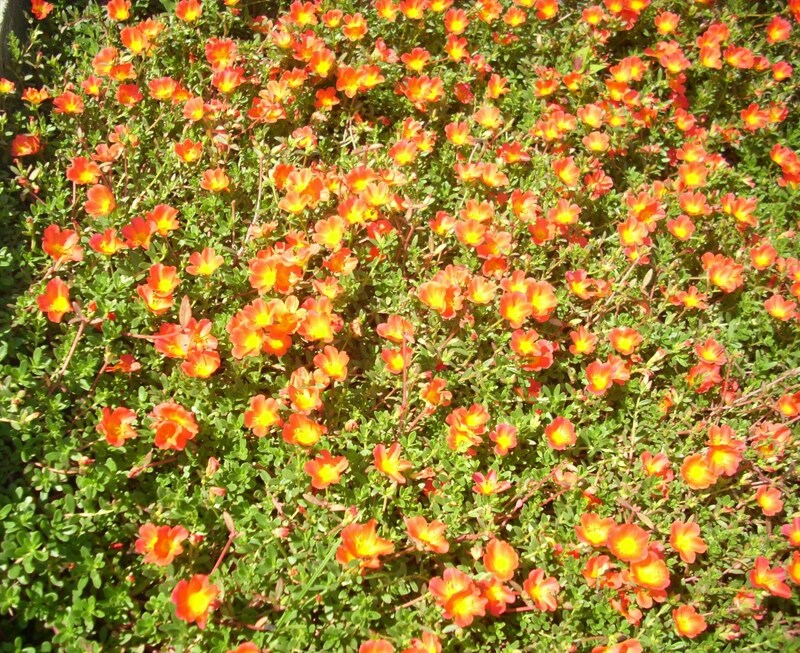 Portulaca grandiflora or Moss rose is native to Asia, Argentina and some parts of Brazil. 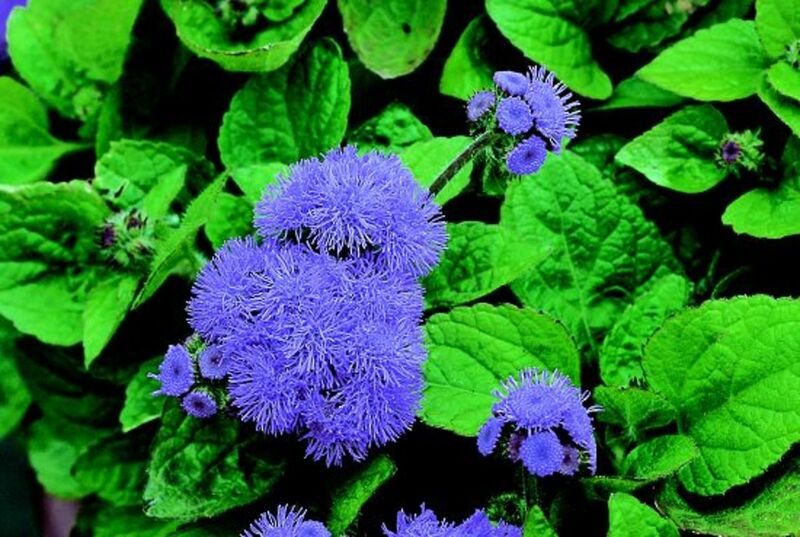 It is a small flowering plant which grows easily up to at least 30 cm long when it is planted in a hanging basket. The leaves are at least 2 cm long, thick and fleashy. 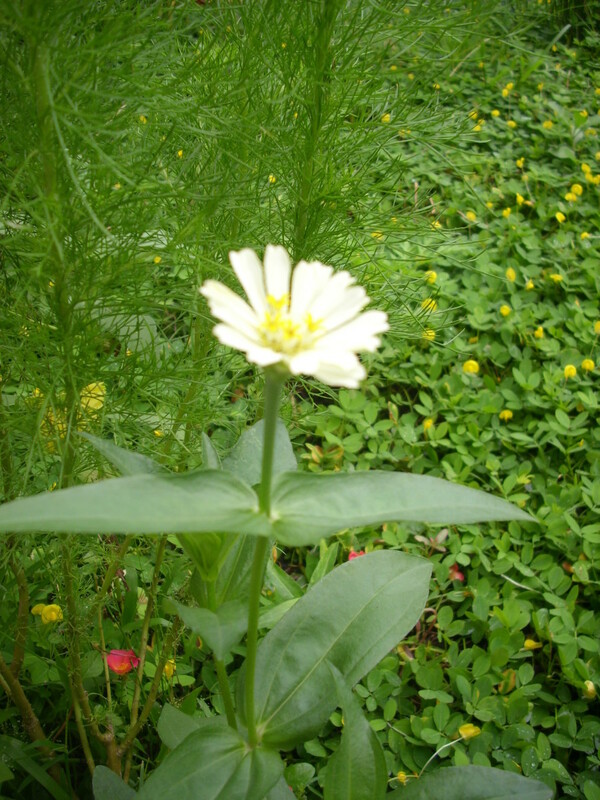 The flower has 5 petals and in 2 - 3 cm in diameter. The colours are in red, yellow, pink, white and orange. It needs sunlight, well drained soil and less care. Heliconia or Birds of Paradise is a common name of Strelitzia, a genus perennial plant. It is named in honor of Queen Charlotte of Englands´ birthplace Mecklenburg-Strelitz, which is in the northern part of Germany. 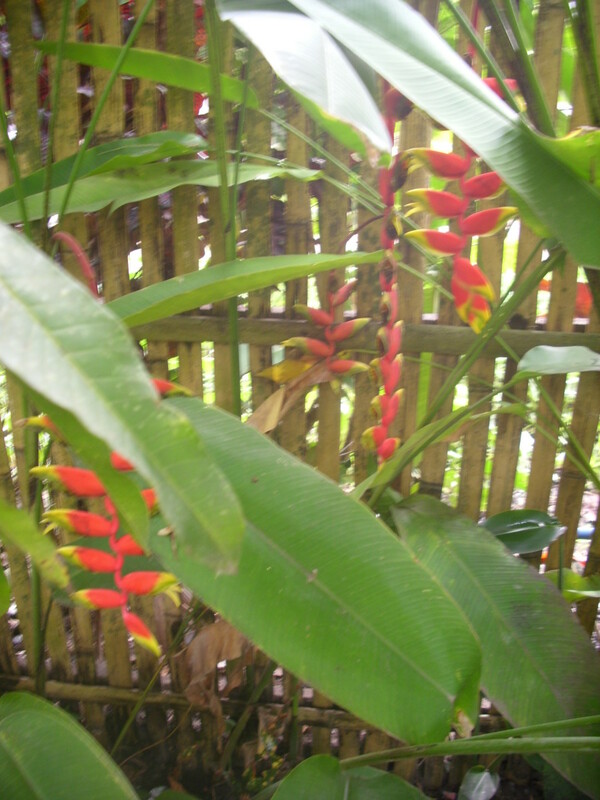 There are more than 100 varieties of Heliconia and they are native to tropical countries of America and Asia. 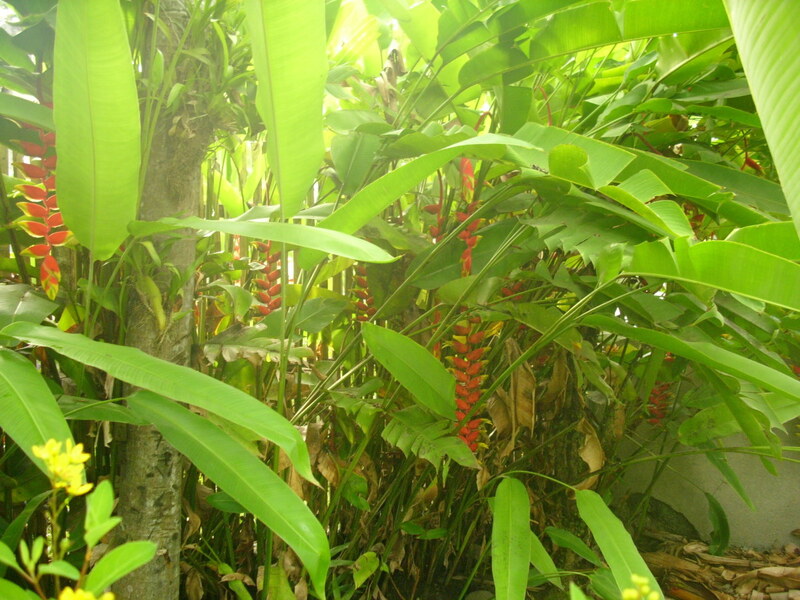 The leaves are similar to banana leaves in appearance, which is ca. 2 feet long and ca. 20 cm wide but has a long stalk. It grows at least 1 meter high. 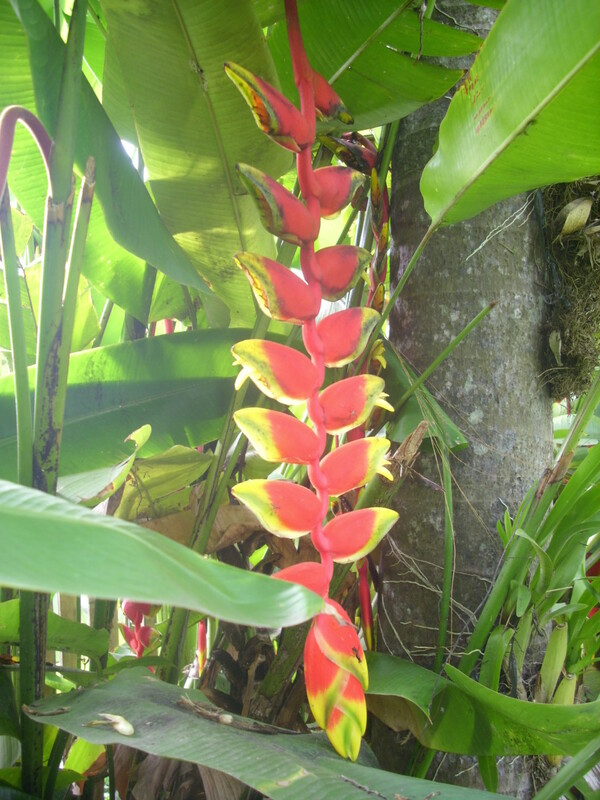 The bracts of the flowers are in red, yellow, green and orange. They are easy to grow and need less care. 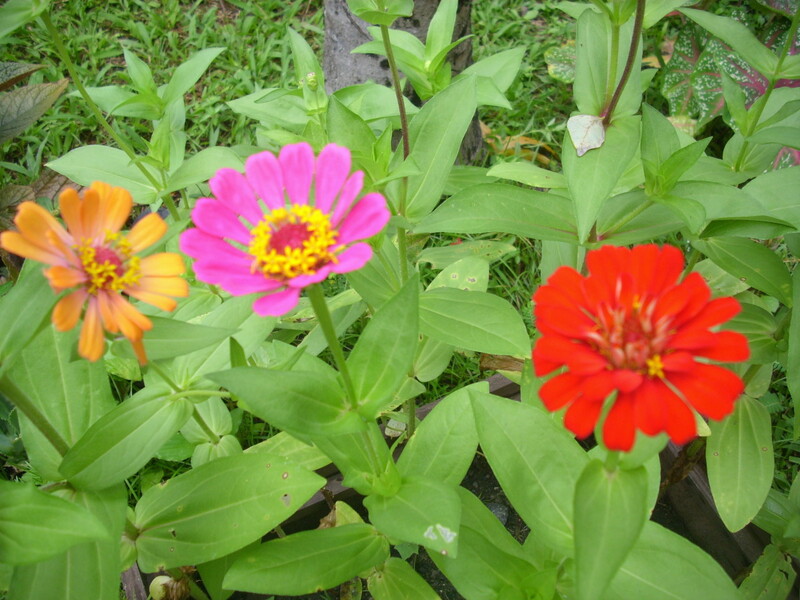 Zinnia elegans is a wild flower which is native to Mexico. It is named after the German botanist Johann Gottfried Zinn. 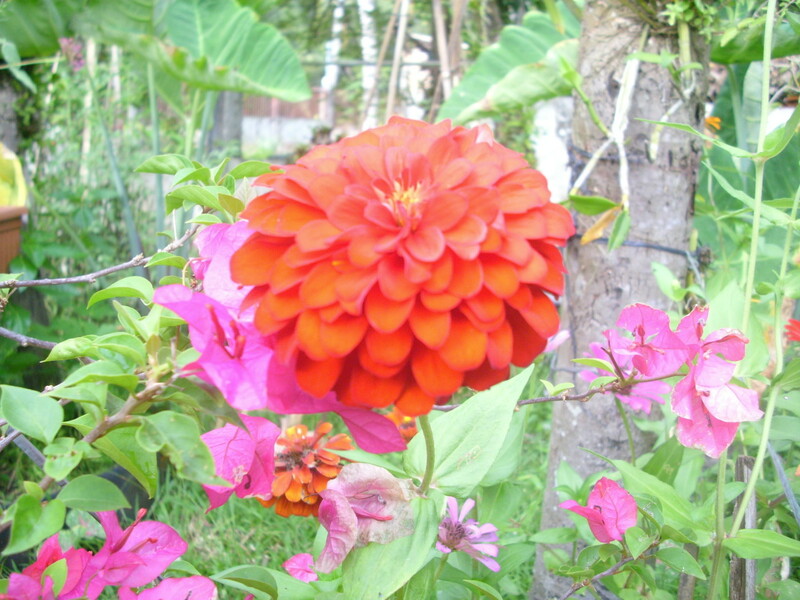 This flower resembles dahlia or daisy. 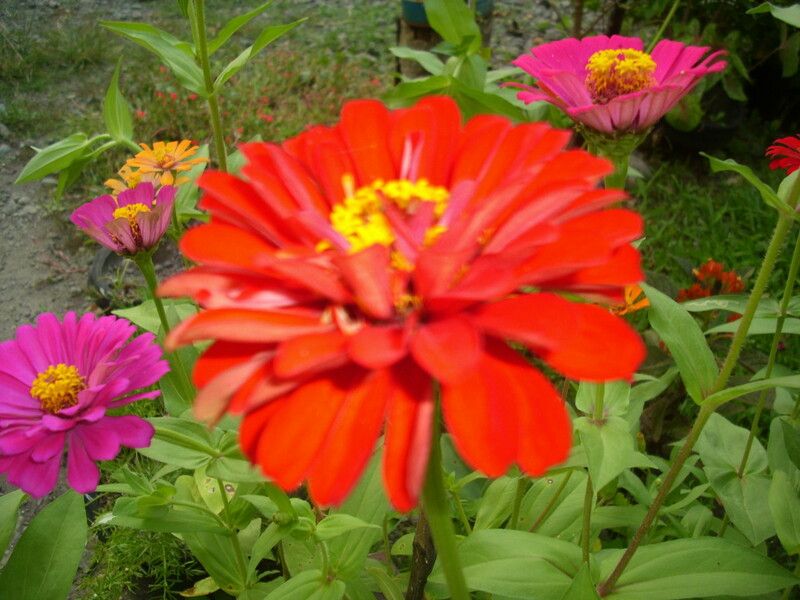 It is easy to grow in a dry, hot and humid climate. 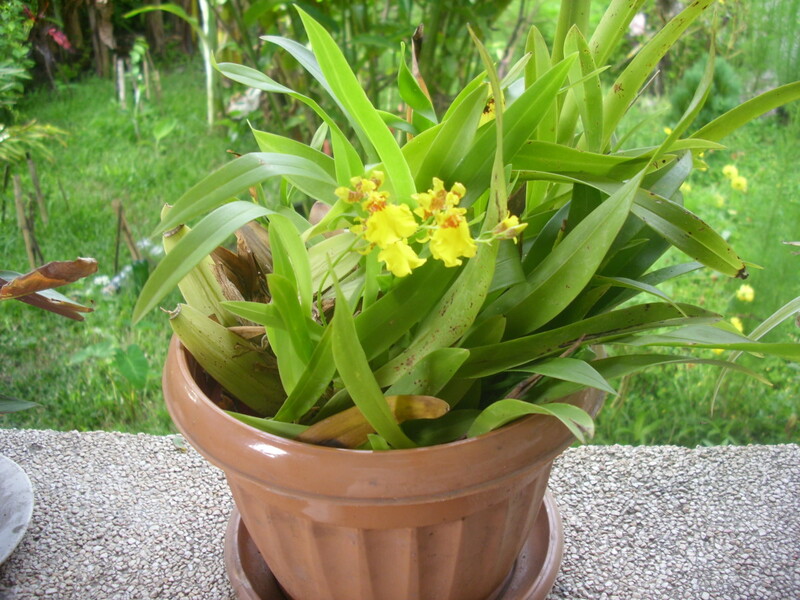 It loves full sunlight and well drained soil. It dies easily when it is transplanted. 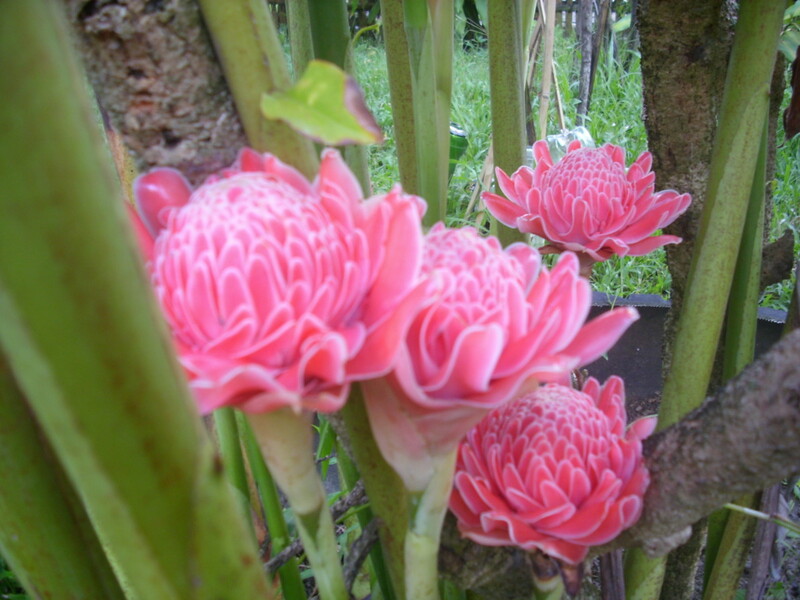 Etlingera elatior has many common names. 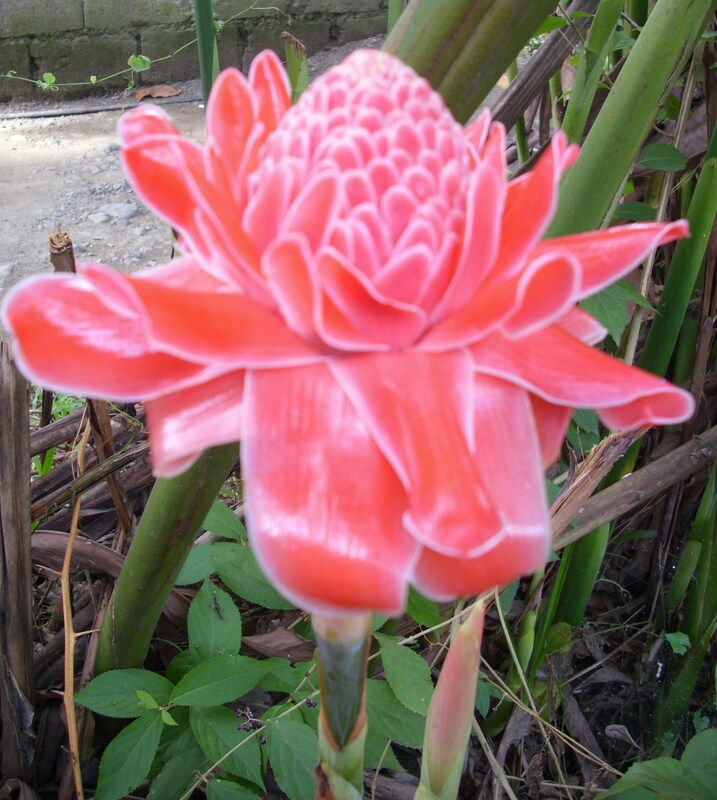 Some call it Torch Ginger, Red Ginger Lily, Torch Lily, Wild Ginger or Philippine Waxflower. 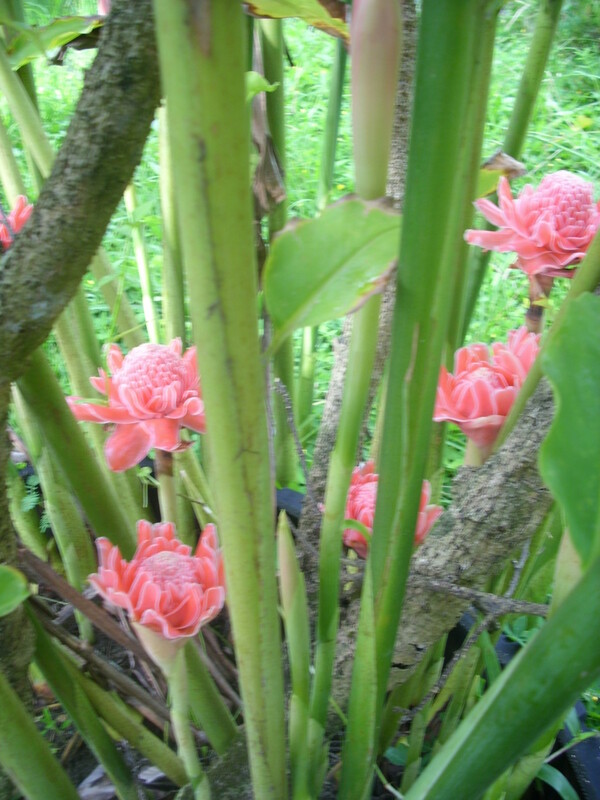 Torch Ginger as I like to call it, is a perennial plant. 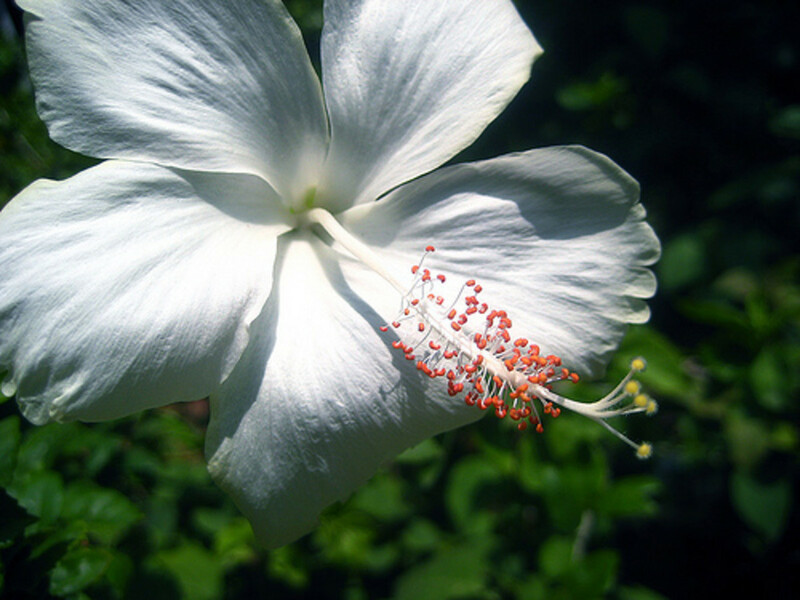 It is native in some tropical and Asian countries. 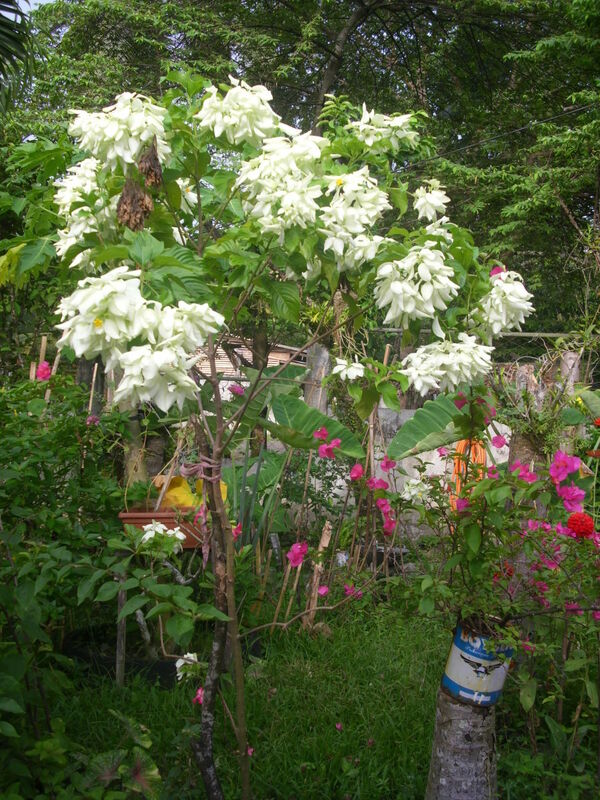 It can grow wild to about 6 meter tall when it´s not trimmed. It has a long stem bud that comes from an underground fleashy rhizomes. 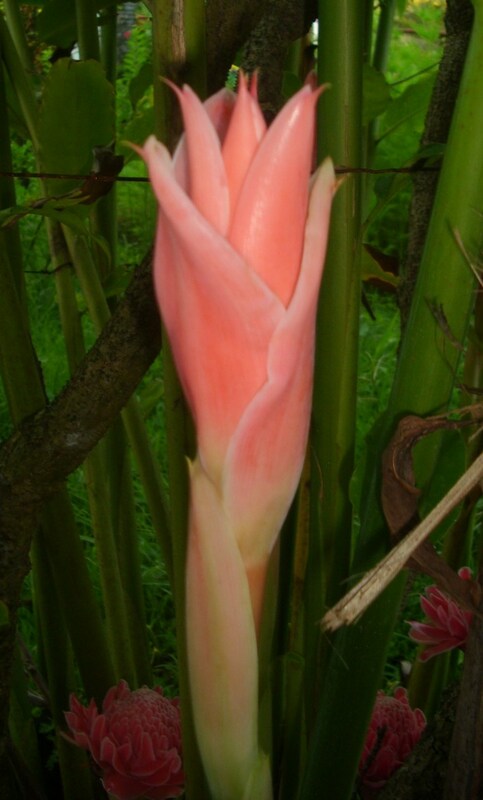 It looks like a torch before it blooms and the inflorescence is in red or pink large bracts. It has a waxy petals. Torch Ginger is the tallest ginger I have ever seen in my life. It´s best planted in a shady part of the garden. It attracts butterflies, bees and birds. The cuttings are beautiful as home ornaments. The unopened buds are edible. They are usually used in Asian cooking. These are some of the flowers in my garden. Birds and butterflies are visiting them everyday. Sometimes I saw a dozen of them flying around the garden, from flowers to flowers. Some of the birds had built their nests on the Birds of Paradise plants, so I hung a plastic bottle half filled with water on a guava tree. Just in case they might get thirsty. I hope I have not bored you. I was thinking that surely, I can write at least 600 words about my plants. I did not expect that through my research, I learned more about them and that this hub has reached more than thousand words. Thank you very much GlenR. I am sure Singapore and the botanical garden were amazing. Thanks for dropping by. What a lovely tropical garden. I have recently returned from a trip to Singapore, where I was lucky enough to explore the Botanic Gardens Your article has reminded me of that time. Hi queenie o! I have check your Pinterest account and I like it. I am following you now. I see you live in my home country. It´s great. Thanks for reading my posts. I´m glad to know you. Enjoy your life there and be careful. Just now found your post and pictures here and on pinterest! It's fun to see another Philippine gardener, and I'm excited to read all your posts. 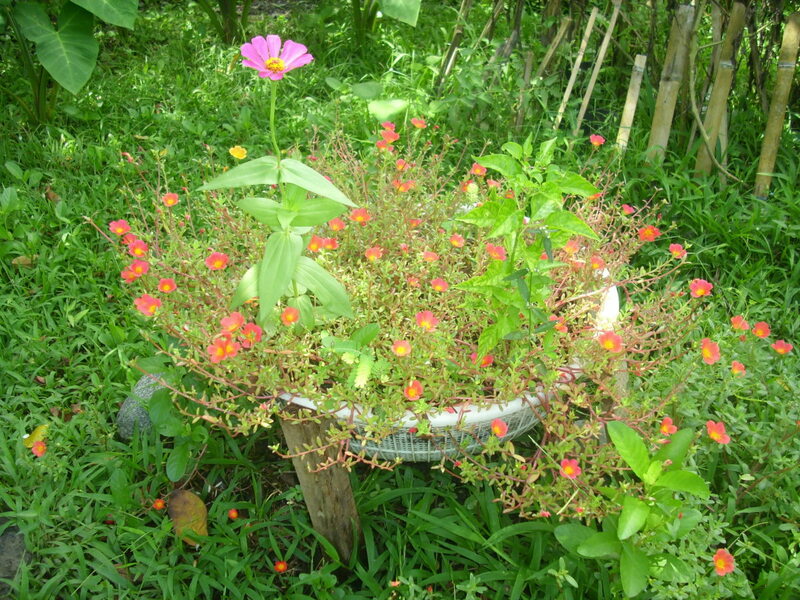 If you'd like to follow my pinterest garden picks, look for my Philippine related boards there at queenie o. Thank you very much for your visit. Sorry to hear about the death of your mother. I did not know the name of Torch Ginger until I accidentally saw the flower online and checked it out and voila I knew the name. It´s easy to plant that flower in your garden and you don´t have to take care much of it unless you have to cut the branches when they are tall. This plant thrive so fast. I mostly bring this flower to the grave of my mother and I use them as ornament inside the house. Thanks for your visit. Have a nice day! What a beautiful hub! Thank you for sharing your garden. 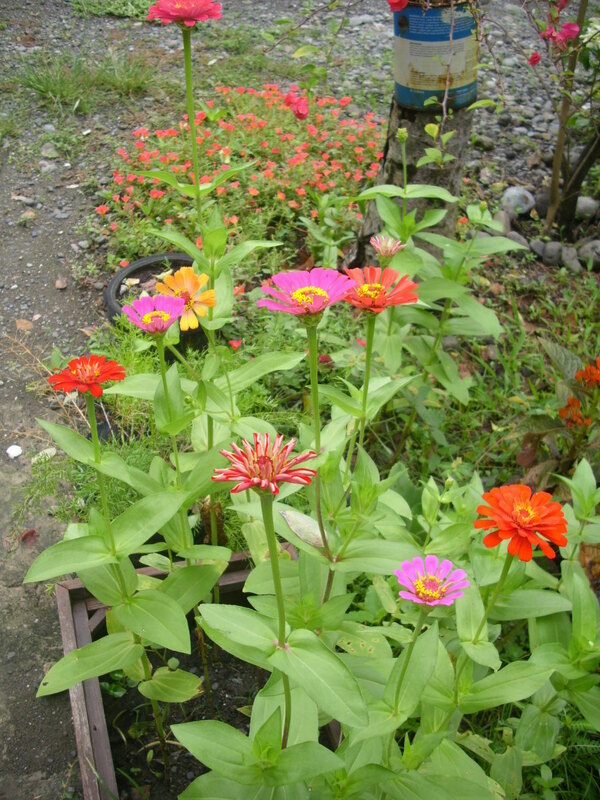 It reminded me to strive for one of my bucket list...to have my own garden full of different flowering plants. It reminded me of my mother...she had a garden full of these flowers. When she died last July 2014, we discovered that most of our neighbors in Bicol have them in their gardens courtesy of my mother. They also shared that my mother regularly bring those flowers to church. Thank you very much FlourishAnyway. Yes, it´s nice to have a warm weather again. I hope spring will come soon. Happy Sunday! What a beautiful hub. Especially with all the snow on the ground your beautiful garden makes me dream of warmer weather. Thank you very much for your wonderful comment How to - Answers . I appreciate that. Yes, I am lucky to be able to spend some time every year in my home country. I hope I can do that this year, too. Happy weekend! You are very welcome. 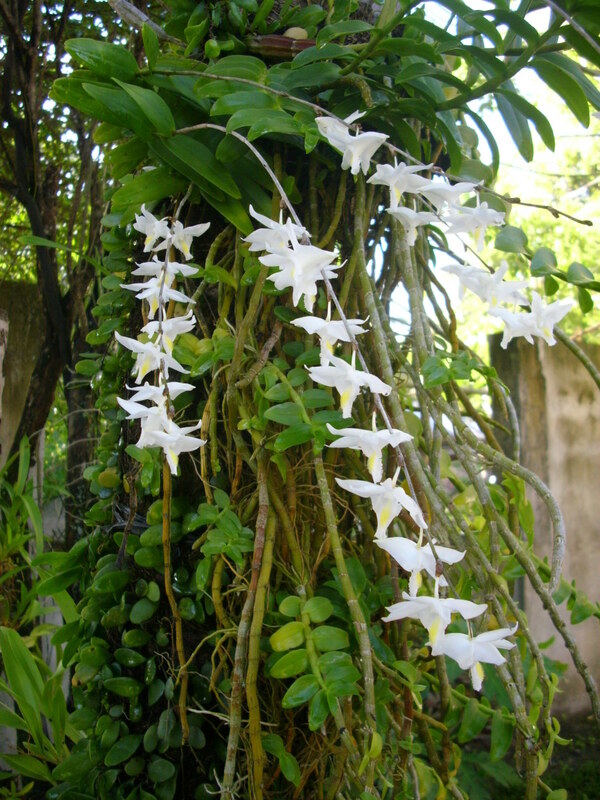 Yes, having the orchids hanging on the trees are special and beautiful to look at. Have a nice weekend! What a fantastic article about your garden in the Philippines and how lucky you are to be able to spend some time there every year. Thank you for your wonderful comment. You know, I am not near to my garden now as I am in my adopted country Germany. My garden is taken care of my cousin now as I am very far away and the flowers are getting plenty. She updated me every week while I´m away. I hope to be able to be there before this year end. Thanks again for your visit. What an amazingly beautiful hub! I love growing flowers but do not have so much space. So most of them are in pots. But my heart is filled with joy, each time a new bud comes out. Your garden looks amazing and I love each variety of flower displayed above and their beautiful pictures. Thanks for sharing this wonderful hub, voted up! Hi Susie aka colorfulone, thanks for your nice comment. I appreciate that. Have a nice day! Thelma, your love for flowers shows brightly in the colorful gardens that you care for. Thank you for sharing so many pretty photos. Hi tobusiness! I am glad that you like what I have written. I have more flowers in my garden now which were not yet there when I wrote this hub. I think I will write another about my garden. Sorry to hear about your mother. Thanks for your wonderful comment. Merry Christmas to you and advance happy New Year 2015. Thelma, this hub is a veritable feast, not only for the eyes but for the soul. I could easily sit here and happily scroll from image to image. Your story about finding the garden in a sad state, reminded me of when I returned to the Grenadines after the death of my own mother. 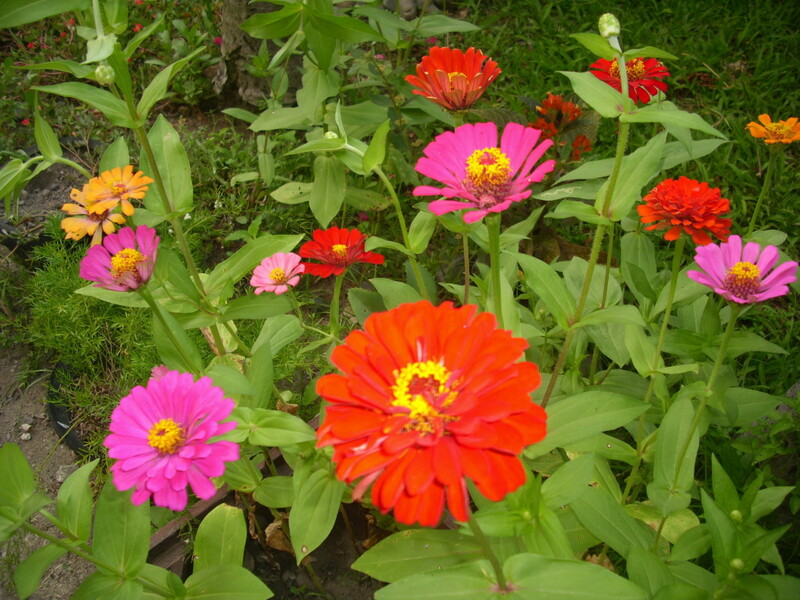 Your orchids are glorious, zinnias were the first flowers to bloom in my very first garden. A real pleasure. Hi greatstuff! Oh, yes I can update this hub as my garden has plenty of flowers now. Thanks for reminding me this. I will do that as soon as possible. Thank you for your comment. Have a nice week! Hi Nell! Thank you very much for your visit and for sharing this hub to others. Yes, it is wonderful to live in 2 different countries but it also needs money for the tickets. Good night! Have a great week! I just came across this hub of yours and it's almost 18 months since you wrote it. I bet your garden has better and more beautiful blooms now. I love all the plants that you have esp. orchids and helicons. Maybe you should update and shows us the latest photos! Yes, I am so lucky to enjoy both of the best of my countries. 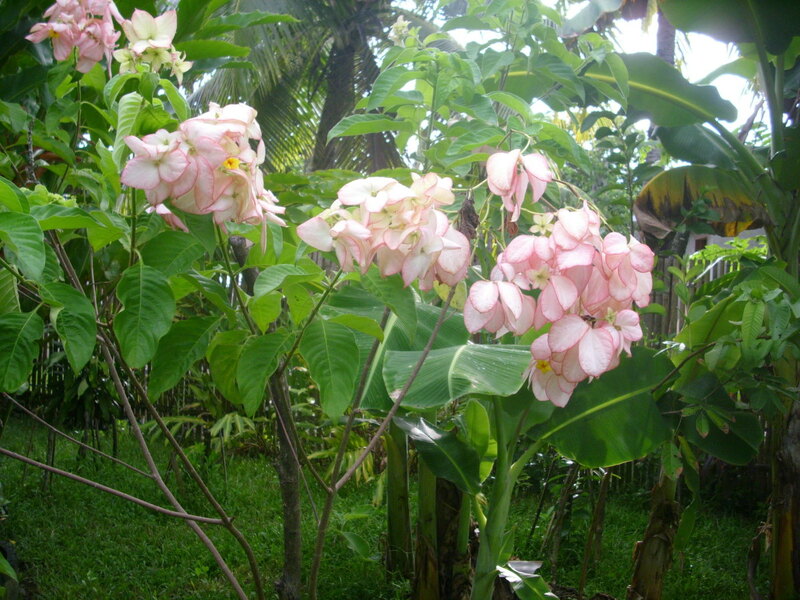 Mussaenda is a beautiful flower and it is easy to plant. 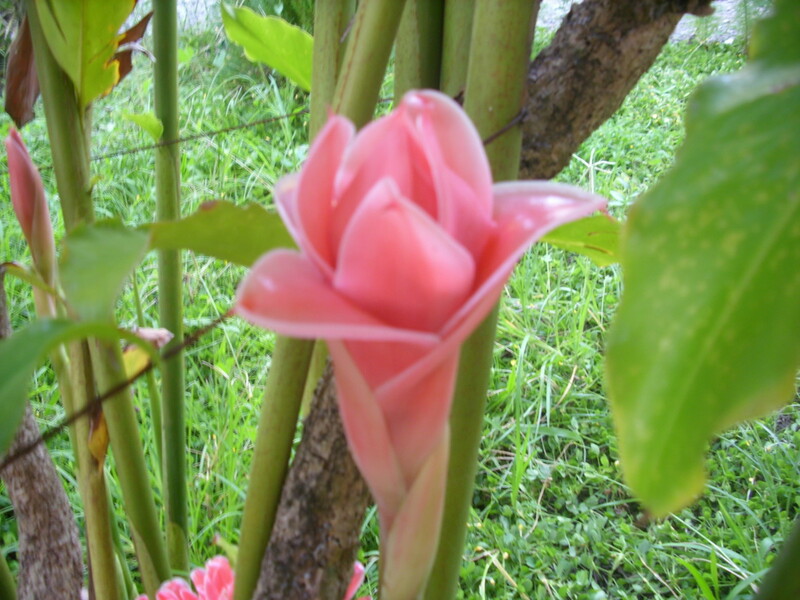 You can plant this flower in a pot and put this inside the house during winter time as this is a tropical flower. Thanks for your wonderful comment. Have a lovely day! How lovely that you are able to live between Germany and the Philippines on a season basis, enjoying the best of both! Some of your flowers are common to our area but there is one I would like to add to my garden. The mussaenda would be a wonder to enjoy with its beautiful year round blooms, but I'm not sure our climate would be good for it. Thanks for sharing your photos with us! Thanks for your wonderful comment. That is great. What kind of seeds do you have? I will be glad to contact you soon. Have a nice day! Thank you very much for your visit thomdrilling. Portulaca is one of my favorites. Have a nice day! 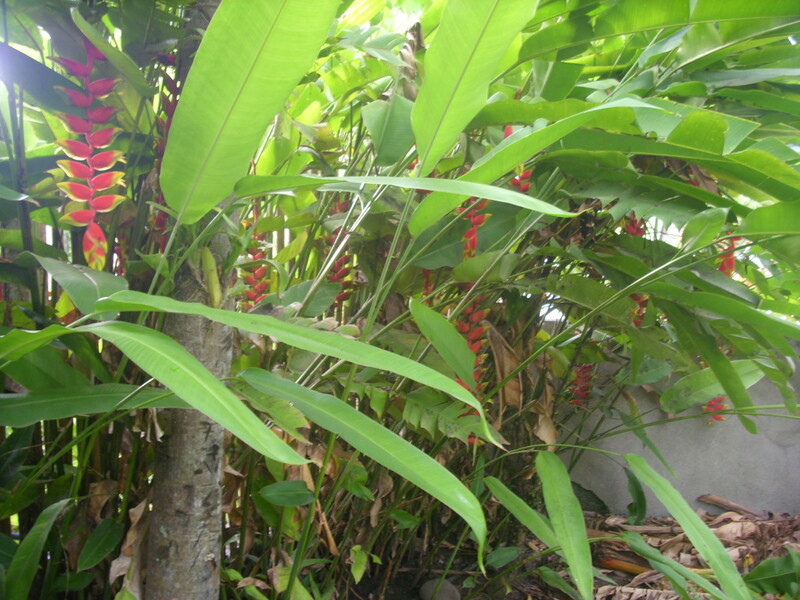 I am indeed so fortunate to be able to go home to my tropical garden every year when winter is so cold in Europe. Thank you very much for your wonderful comment. Have a nice day! How fortunate you are to have such a lovely tropical garden to retreat to when Europe is cold w/ winter! I can imagine the incredible fragrances that go along with this stunning array of flowers that you have lovingly brought back to vigor. Thank you so much for sharing your beautiful photos! Thank you very much precy anza for your visit. I´m glad you enjoyed the tour. Have a nice week! Such beauties! :) Thank you for sharing us your photos. I enjoyed the tour in your beautiful garden. Thank you kerlund74 for your visit and for your comment. I appreciate that. Have a nice day! What a fantastic garden, I love flowers and gardening but have a very small space outside my house. I enjoy your photos, wonderful! I agree with you JPSO138. A garden is a part of the house in our country. I´m from the south of the Philippines, Mindanao. Thanks for your comment. Good night! Happy weekend! Nice flowers indeed. Mostly in our country especially in the countryside, most houses do have gardens.There are also those within the city despite the fact that there is lesser space. 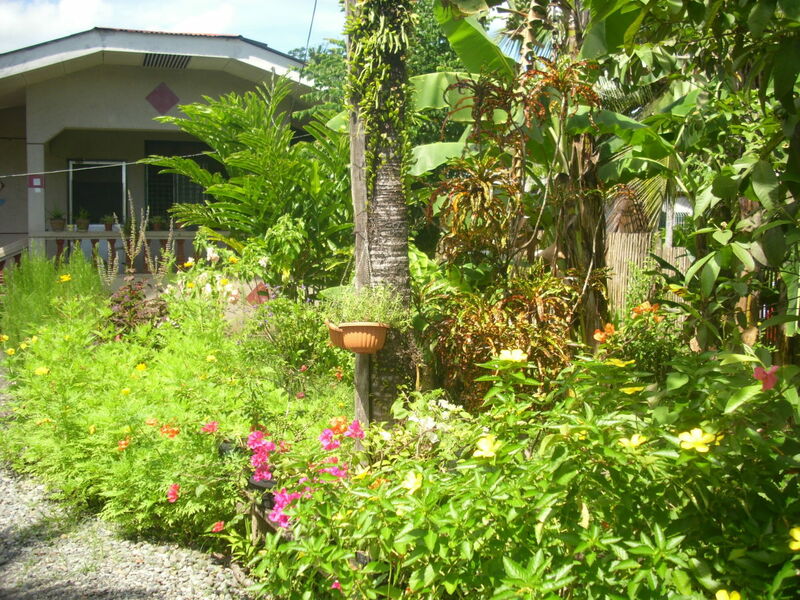 Bottom line, Filipinos love gardens. Which part of the Philippines are you residing? You are welcome oceansnsunsets. I´m glad you like seeing my garden. They are more like a colourful mini forest now as some of these flowers are blooming in different colours. Thanks for stopping by and leaving a comment. I appreciate that. Have a great week! Hello Thelma, thanks for sharing the beautiful flowers from your garden. They are quite impressive! It is great to see what grows well in different parts of the world, loved seeing it. Thank you for your visit. You can have orchids in pots in your warm living room. 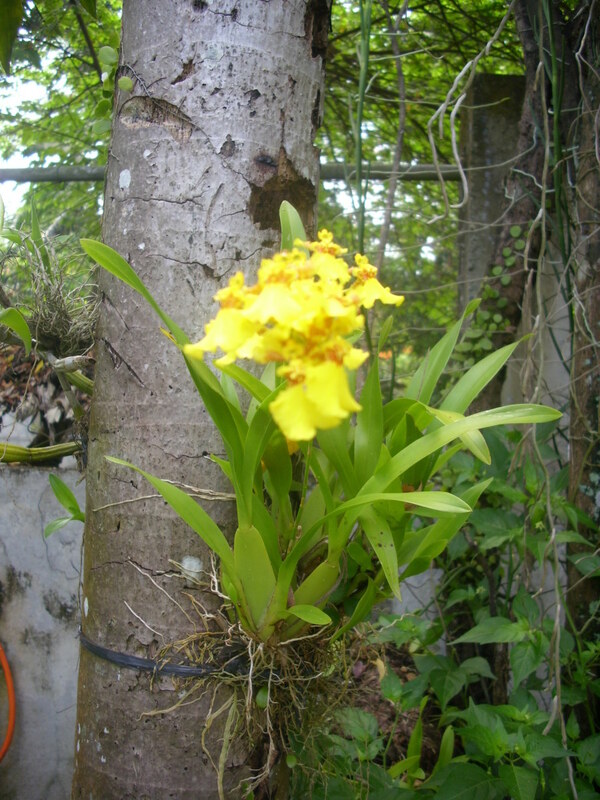 It´s possible to grow and let them flower well as I had orchids in Ireland before. It gives a lot of flowers. 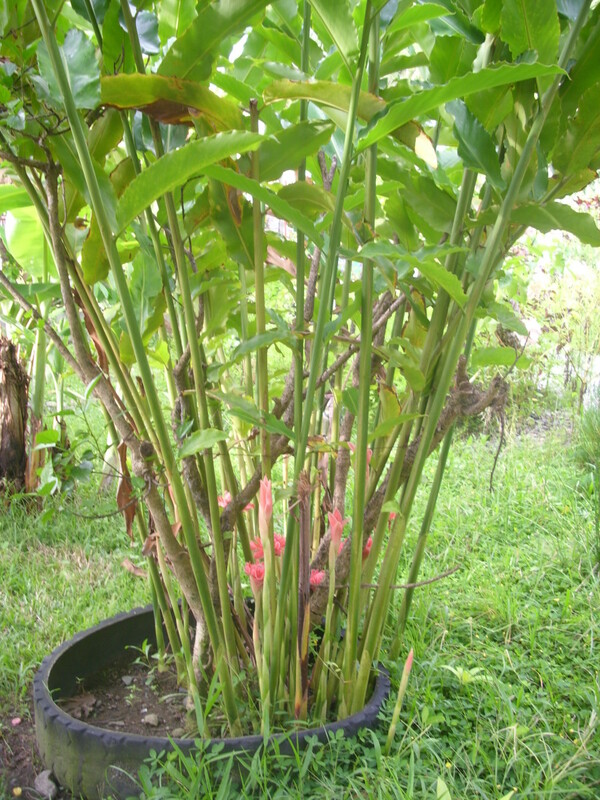 About the plumeria, have you tried fertilizer? It needs to be in a warm place too. I hope this flower will bloom soon. Have a great new week! Wow, you have such a beautiful garden, and great photos. 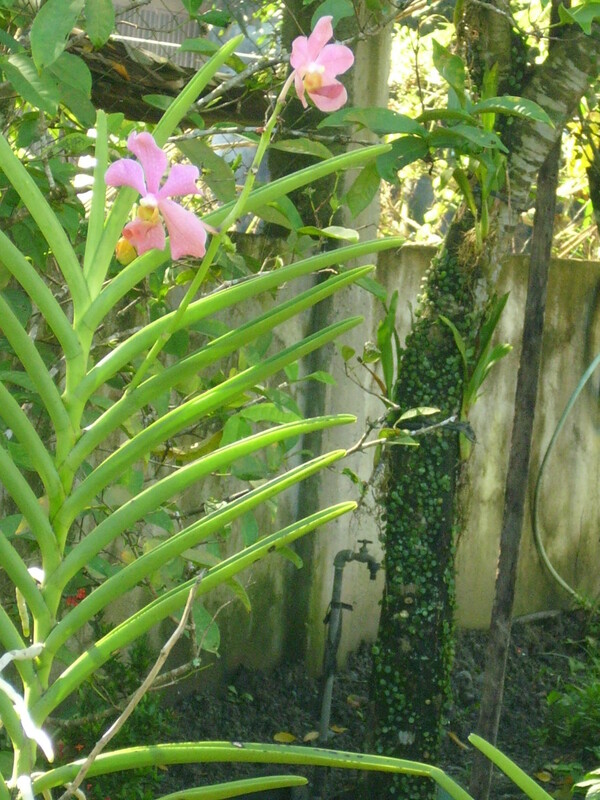 I love the orchids and plumerias, I wish I could grow them here in chilly old England. I have a plumeria in a pot in my glasshouse, it was a cutting that I brought back from Hawaii, it grows leaves every year, but sadly it has never flowered yet. Hi Liesl! You are very welcome to visit my garden and thank you for admiring it. Have a nice new week! Hi! Thelma, you got a lovely garden full of lovely flowers. Thanks for sharing your beautiful flowers and garden photos. Voted up. Hi dreamseeker2! Thanks for your visit. I´m glad you have seen how Plumeria looks like. 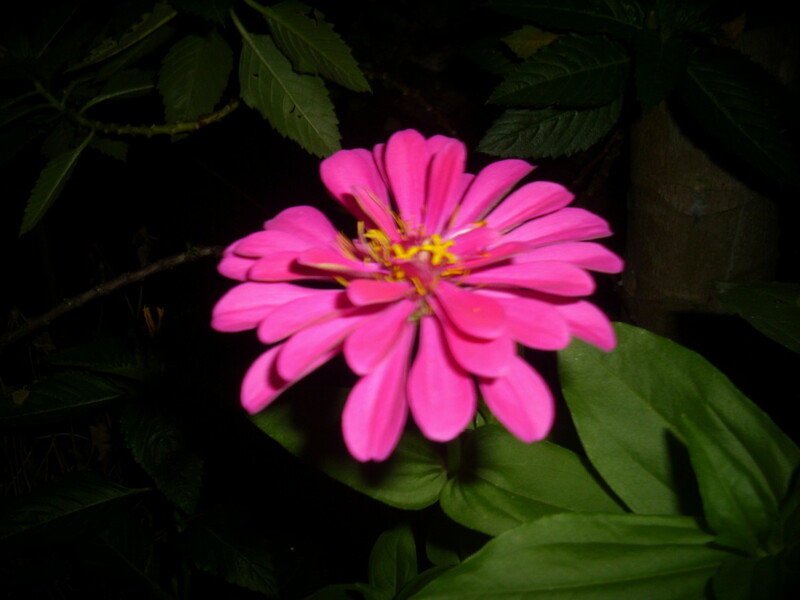 It´s a beautiful flower. Have a greet week! Hi Donna! I´m glad you like my garden. Yes, I have spent a lot of time planting. It was a relaxing time for me after writing online. Thanks for stopping by. Have a great day! Hi Thelma I like gardening and I LOVE flowers, so this was quite a treat/dish for me. I felt like I had left my stuffy office, glaring computer screen, screaming child and walked out into a peaceful, beautiful, garden. You must have spent a lot of time on that garden to make it so healthy and happy. Thanks for sharing. I will be coming for more on this very hub. Thanks for your visit thumbi. I appreciate that. Have a lovely sunday! I love flower gardens. Appreciate anyone who does the hard work of gardening. The photos are lovely. They also look bright and sunny. Hi Suzettenaples! Thanks for your visit and for appreciating the beauty of my garden and my green thumb. Yes, indeed I´m blessed by God to be able to visit my home country during winter time. I´m glad you enjoyed reading my hub. Thanks for sharing this hub to others, too. Good night! Thelma: You have a gorgeous garden and quite a green thumb. I love bougainvilla and we have lots of it in Florida. 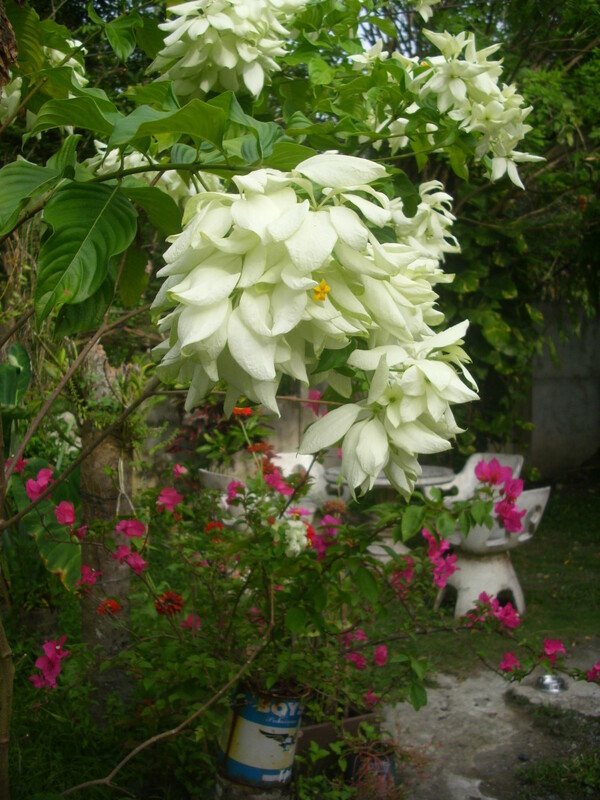 You have unusual flowers in the Philippines that I have never seen before and they are lovely. How wonderful to get back to the Philippines during Germany's cold winters and then return to Germany for its lovely spring and summer. You are blessed. I so enjoyed reading and viewing this hub - your photos are wonderful. Thank you for your visit sgbrown and for pinning. I appreciate that. 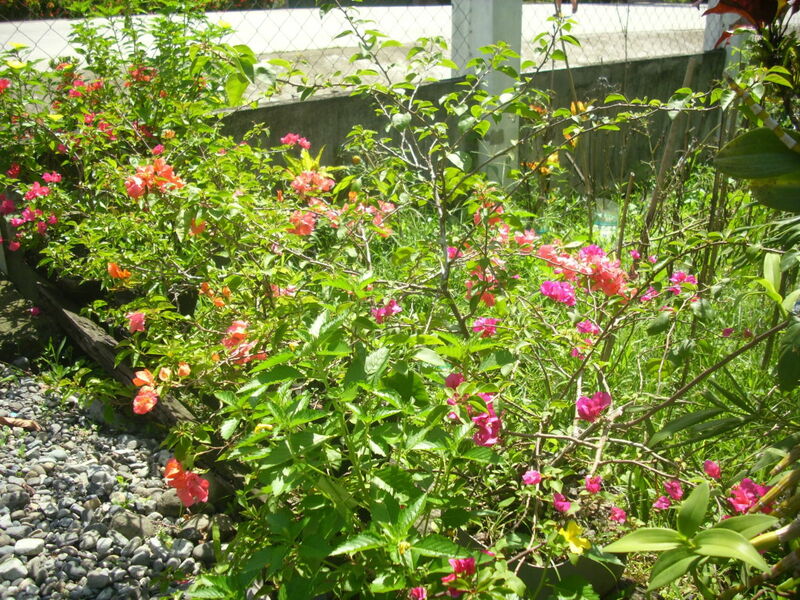 Bougainvilleas and Rose Moss love the full sun and they are easy to take care of. Have a lovely week! Thank you Rebecca. I appreciate your stopping by. Have a lovely day! Thelma, your flower garden is simply beautiful. Thanks for sharing, what an inspiration! Thank you Pagesvoice for your wonderful comment. I appreciate that. Have a great sunday! Voted up and +++ I thoroughly enjoyed this photo and word journey. Splendidly beautiful is the best way to describe your flowers. I too share your love of gardening and it is always such a joy to see new flowers emerge and blossom. Happy sunday Pstraubie! That´s a great thing to do in the morning, playing with the flowers in our own yard. I am missing that now as at the moment I´m in Germany and I don´t have a backyard here besides flower pots inside the house. Thanks for dropping by and for sharing this to others. Have a great sunday! Thanks for sharing these lovelies with us. I spend the better part of each morning playing with the flowers in my yard . It is so much fun to see the lovelies in another's yard. This is oh so beautiful Thelma ;love it and vote up. Thank you Marsha. I live in my home country Philippines for a few months every year. The forest is a few kilometers away from my house although I have created a little "forest" in my garden. I wish you will have a nice garden in the future Marsha. Don´t loss hope, it will come sooner as you think. Yep, I see that too. I have discovered that there are lots of hubbers who enjoy gardening. Thanks for the vote and pin. Have a lovely week! Beautiful. The main picture you used of the Bird of Paradise looks like you live in a tropical forest. Very nice garden. I hope to have a nicer one as time goes on, right now I don't have much time or money to invest in it, but I'm plugging away as best I can. From all these comments you can tell how much readers enjoy gardens. Thank you Rosemay. Yes, I have worked a lot to make this garden looks beautiful, but it was worth it. I will always take care of my garden as long as I'm there. I hope it is being taken care well at the moment as I'm not there for a few months. Thanks for your visit. Enjoy your week. Thank you, Audrey. Have a lovely week! That was so nice to hear about your wonderful stay in the Philippines. I'm glad I have brought up a good childhood memory of your stay there. I'm sure you had a wonderful time with your father. Thanks for dropping by again. You are always welcome. Yes I have a wonderful week and I hope you had, too. Have a lovely week! You have a stunning garden. 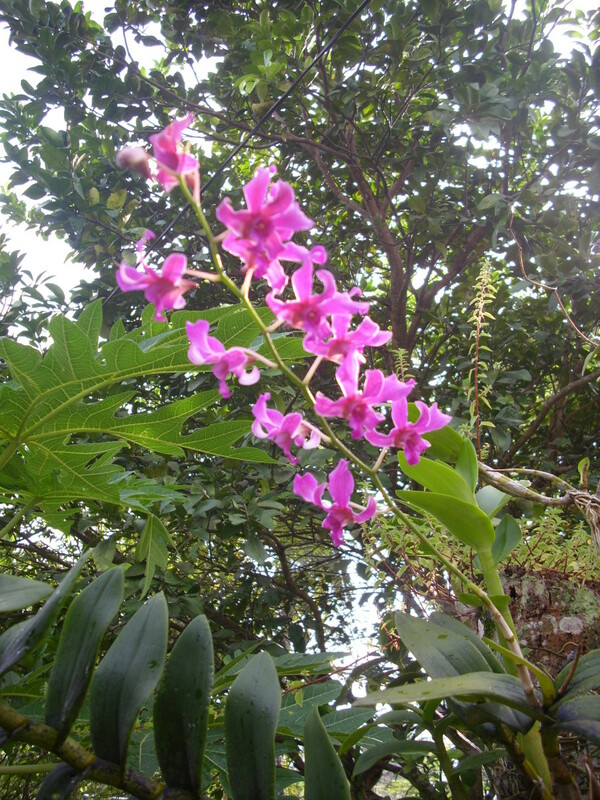 Thank you for sharing your photos, beautiful especially the orchids. You put a lot of work into your garden, now you reap such lovely rewards. Thank you Moonlake. You are always welcome to visit my garden. Have a lovely sunday! Thank you Millionaire Tips for your nice comment. I appreciate that. Have a lovely weekend! 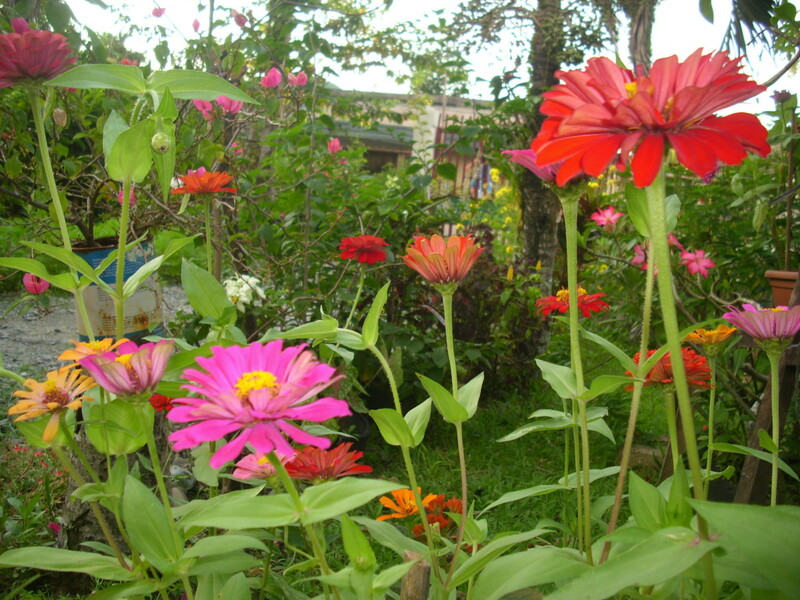 I enjoyed seeing all the beautiful flowers in your Philippines garden. They are so pretty, and so many are different from what we can plant here. Hi Shrouds! Yes, I was busy with my garden but I enjoyed and I love doing it. Thanks for your visit. I appreciate that. Have a nice day! There are many great flowers photos here,I think you must be very busy doing some gardening in your leisure time,keep it up it is good to keep you busy and a fresh mind actually,I do like flowers too! You are right Brownella. That was exactly what I was doing every morning before drinking my tea. How do you know? LOL;-) I could have given you some bougainvilleas when you were my neighbour in the Philippines. Thanks for stopping by. Have a great weekend! Good morning Prasetio! I´m glad you like my garden and of course you are very welcome to visit my flowers. That would be nice. Thanks for stopping by. Have a nice weekend! Thank you Crystal. Yes, it´s my own little oasis. I like relaxing between the flowers and banana trees. I might as well put hanging swing on there, lol. Thanks for dropping by. Yes, they are Angelo. Thanks for your visit. Have a nice weekend! Beautiful flowers! Looks like you have your own little oasis. voted up and beautiful. The flowers were very pretty. That is an amazing garden you have. Hi Peggy! 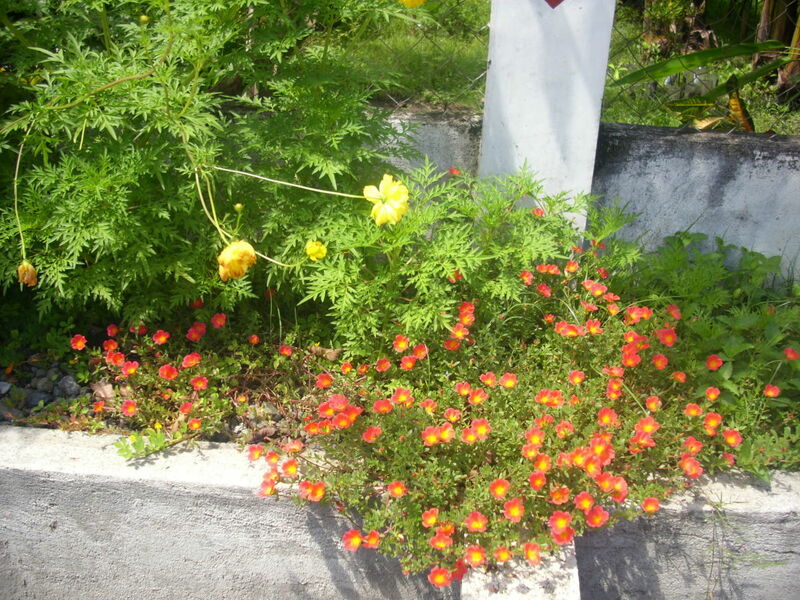 Whenever I visited the grave of my mother, I brought her a bunch of different flowers from our garden. Some of the flowers I brought for her are newly planted that she had not seen them when she was alive. Thanks for stopping by and for sharing this hub to others. Have a nice weekend! Your garden is simply beautiful. I adore flowers, but I have very few myself, even though I come from a line of flower lovers. Caring for flowers is not my cup of tea. I only keep those that thrive without much help. My mon often shook her head whenever she came to my house and looked at my small collection. I choose to keep just enough for my space and enjoy the abundance of others. Afterall, most flower lovers enjoy showing off their beautiful work. Whenever I want arrangements in my house, I buy them at a garden center or grocery store. Thanks for sharing your awesome photo gallery! I am voting up and sharing also. Both of our mothers are now in heaven. Nice that you can tend some of the same plants that she cared for while she was in that gorgeous garden. You surely have a beautiful one! I was familiar with most of the plants except for the Mussaenda Bush. What a beauty! Many up votes and sharing. Thank you for your nice comment Rajan. I appreciate that. Have a wonderful weekend! Hi Rebeccamealey! I´m glad you enjoyed reading my hub. I have only knew the names of most of these flowers when I was researching online. You can imagine how difficult it was. Thanks for stopping by and I hope this inspires you to plant flowers in your garden. Have a lovely weekend! Your garden is lovely and this a beautiful spread of flowers you have growing. Very interesting reading as well. Voted up and interesting. A beautiful garden, I learned some new flowers that I really wasn't familiar with. I enjoyed your pretty photos. They are simply lovely and make me want to plant all kinds of flowers! Thanks DDE for dropping by. Bougainvilleas are beautiful. I have not seen bougainvilleas in purple. It sounds awesome. I wish I would have that color, too. Maybe one day. Have a lovely day! 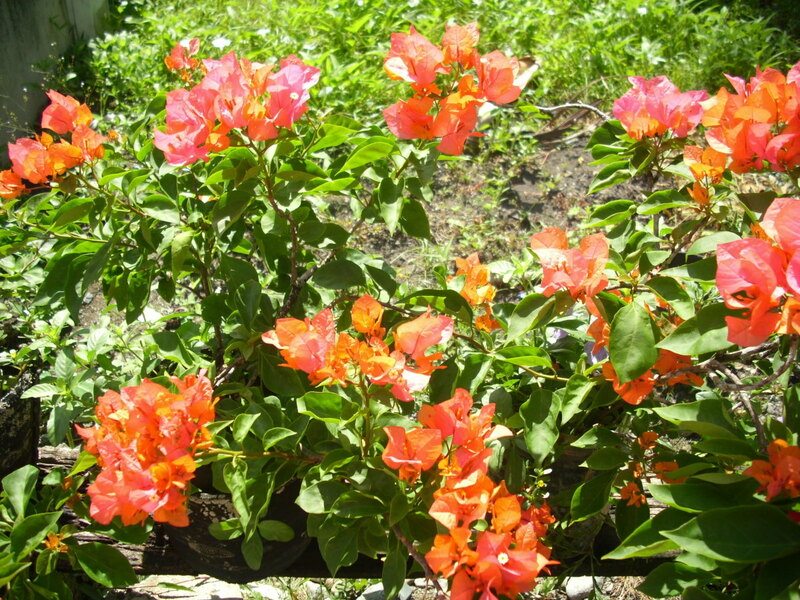 You have such a lovely garden of flowers, great selection I have the Bougainvilleas in orange and purple I enjoy having a beautiful layout of flowers it brings out the beauty of life. Thanks angryelf for your comment. Have a great day! What a beautiful garden! Orchids are my favorite as well! Thank you Ingenera. Yes, it is nice to have sunshine and warm weather than a cold and freezing one although I sometimes missed the snow especially at Christmas time at the Christmas market in Germany. Thanks for stopping by. Have a great day! phdast: how fantastic your comment is! You must have a very good imagination to almost smell the flowers and plants in my garden. I like it. Just like me when I think about the ocean or beach, I can immediately hear the sounds of the waves when I close my eyes. Thanks for your comment and have a lovely sunday! Hi Dolores! I like to look at other people´s garden, too. It´s one way of having a good idea for my own garden. Gardening is a hard work but if you enjoy doing it, you´ll never see the hard work. What you see is the beauty of what you have created and that´s a reward for us. Thanks for stopping by. Have a great sunday! Thelma...I enjoyed my visit to your charming garden, looking at each of the lovely flowers you grow. Thanks for sharing.